So what is the perfect location? 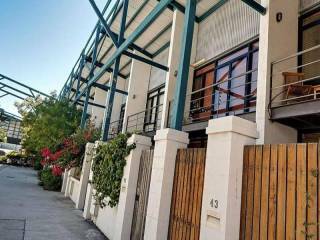 This house is located right in between south beach and the famous cappuccino strip in fremantle, this gorgeous town house is equally convenient for the free Cat Bus into town or for a dip in the Indian Ocean. Enjoy! Built in 1901 this terraced sand stone cottage, nestled behind a wild rose hedge, is brimming with heritage charm. The house has two bedrooms, one bathroom, a fully equipped kitchen and a lovely private back garden with outdoor dining facilities and barbeque. We offer a queen sized bed in our front bedroom and a triple bunk in our quiet back room which faces onto our leafy garden. 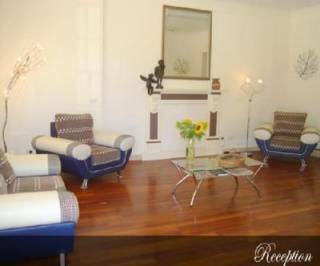 The house has been tastefully furnished with local art photography, furniture and antiques. Children are very welcome and buckets and spades are available for those ambles to South Beach. Free unlimited wifi is provided. You will be ideally situated, easy walking distance to the beaches in south Fremantle or to Fremantle town and the “cappuccino strip”. Local south Fremantle cafés and restaurants are just around the corner. A free local area “CAT” bus stops nearby which loops to the beach and Fremantle centre. Come and enjoy a slice of the South Fremantle lifestyle and live like a local. Located on the coast just 30 minutes from Perth's city centre, the bustling and dynamic port city of Fremantle has long been renowned for its eclectic mix of arty and alternative types. Its streets buzz with the song of buskers, the side walks fill with a wild collection of art and music floats out from trendy cafés and bars. 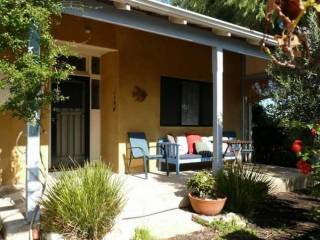 This is an ideal place for visitors to Fremantle and is also close to South Beach. Hop on the Free CAT Bus and ride to all of Fremantle's attractions - featuring the famous cappuccino strip, Fremantle Markets, boutique shops, cafes, bars, restaurants are just around the corner. Perth is easily accessed by train, bus, swan river, taxi and by car. Day trips include the beautiful Swan valley were you can drive round and have a nice lunch at the local winery's, boutique breweries and restaurants, and Rottnest Island is just a 30 minute ferry ride from Fremantle. Margaret River is a 2.5 hour drive south - which is home to WA's famous wine region and surfing spots! Gas BBQ, linen and towels, fully equipped kitchen, Air Conditioning, Music Player, DVD, Cot and High Chair, Microwave Oven, Refrigerator, Flat screen TV, Non-smoking indoors, Iron, Washing Machine, tumble dryer, Wireless internet, enclosed courtyard.